i want to develop a application for face detection and matching. So can anyone please tell me how can i use AVM in my project . 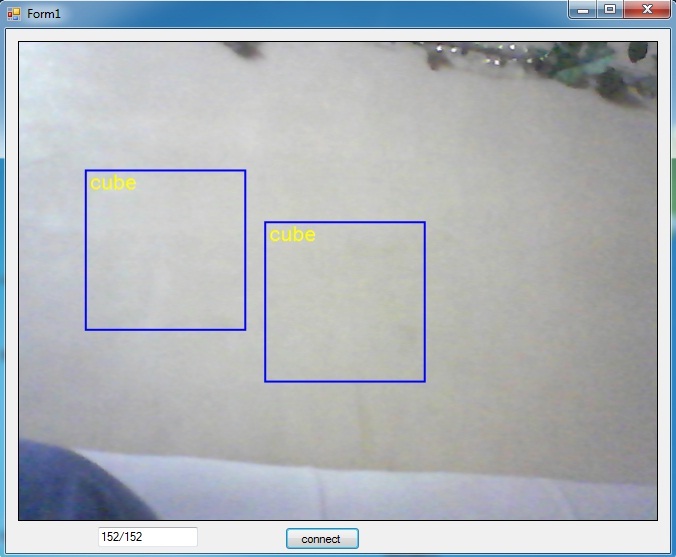 I want to develop a simple desktop application ,Which captures a image and matches that image . i want some more information regarding AVM. I don't have more knowledge about VBScript.I am developing application in C#.net. I want to know can we use this SDk to learn,train and track objects as shown in AVM Plugin of RR. can you please give me your email id. You can use RoboRealm API ( http://www.roborealm.com/downloads/API.zip ) for connection of your C# (CSharp) application to AVM Navigator module. If you decide to use �Library AVM SDK simple.NET� yet then there is an example in http://edv-detail.narod.ru/AVM_SDK_simple-net.zip archive (.\AVM_SDK_simple.net\samples\RcgExample1\RcgExample1.csproj) that shows how to use AVM for training and recognition of an object. You also can use AVM Navigator as tool for learning of objects with further exporting of AVM object data to "Library AVM SDK simple.NET". You should just train AVM Navigator on some objects (in "Object recognition" mode) further close RoboRealm application and then copy file "avm.dat" to ".\AVM_SDK_simple.net\bin\" directory. This file is located in user folder (for example: "C:\Documents and Settings\user\AVM\avm.dat"). Now you can start ".\AVM_SDK_simple.net\bin\RcgExample2.exe" and select capture device from dialog window and show learned objects in front of your camera. It will be recognized as well as in AVM Navigator. i have done as mentioned by you in above reply , it is working fine. But can we train the objects in RcgExample2.exe. if not then can we add that feature in RcgExample2.exe also. >> But can we train the objects in RcgExample2.exe? You should develop procedure "Learn object" with user interface like in AVM Navigator. What you need for training? 4. Write the new image to the AVM search tree: _am.Write (InterestArea, ObjIndex, true). I will create a procedure as mentioned by you . I will reply you back. But how it differs from exporting of AVM object data as: "AVM Navigator" -> avm.dat -> RcgExample2.exe that I mentioned earlier? If you want to save data from your own program that using �Library AVM SDK simple.NET� then you should use WritePackedData/ReadPackedData methods for data finalizing and Save/Load for data saving. is there any relation between key image size and interest area. i know key image size should be smaller than interest area..i get recognition bu not all the time. and interest area is bigger than key image size..i fix key image size in 80*80...so what is wrong in that..
and there is another question i see your recognition application and i notice that your rectangle is equal width and height..why that?? is it can be different width and height,?? and how much interest area is bigger than key image size?? >> is there any relation between key image size and interest area. i know key image size should be smaller than interest area..i get recognition bu not all the time. and interest area is bigger than key image size..i fix key image size in 80*80...so what is wrong in that..
You are right and key image size must be really smaller than interest area but also it is important to provide the same aspect ratio in key size and interest area. For example if you have 80x80 key size (aspect ratio 1:1) then the interest area should has size: 100x100, 120x120 etc. >> and there is another question i see your recognition application and i notice that your rectangle is equal width and height..why that?? is it can be different width and height,?? As I mentioned the aspect ratio of key size and interest area must be equal. So you should set the aspect ratio of your smallest rectangle area as key image size (values from 80 pixels and higher) and further keep this aspect ratio for the interest area too. For example if you have 160x80 key size (aspect ratio 2:1) then the interest area should has size: 200x100, 240x120 etc. >> and how much interest area is bigger than key image size?? The size of the interest area is limited only by size of input image. thanks alot for your help really..my application get work now well. and i now understand the relation. while sometimes where there isn't any recognition there are some rectangles left from previous recognition..why that..and how to eliminate it..?? 1. Do you use package: �AVM_SDK_simple-net.zip� or �AVM_SDK_v0-5.zip�? 2. What value of image key size is? 3. Which method you use for recognition: ObjectRecognition or ObjectTracking? 4. If you use ObjectTracking method then what parameters was given? 5. What images you use for training of AVM algorithm? I take an interest in such characteristic as an image contrast, the texture frequency and horizontal or vertical lines presence in image. 6. Do you show for recognition the images where target object was rotated regarding initial sequence of this object that you gave for training of AVM? 7. Can you provide video that shows your problem with object recognition? u can say i use mostly your code in RcgExample1. 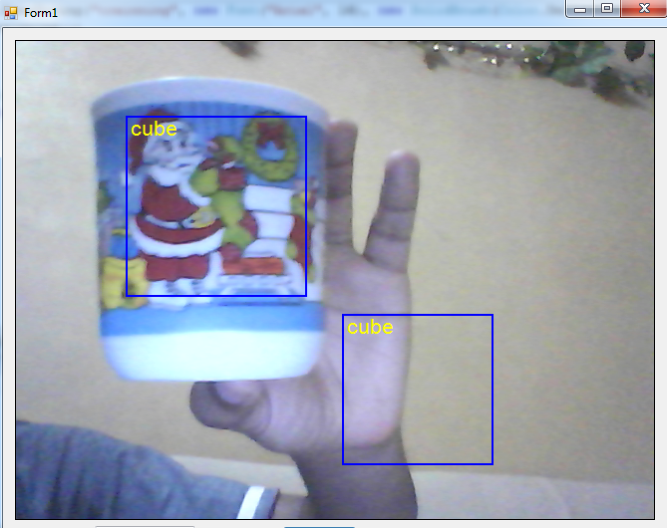 i think the problem here..
and the input image from my webcam..
and that there is to photos for what happen..
the first one it recognize the cup but while moving the cup it left some rectangle. and the second.. i moved away the cup it left rectangle but at all it disappear after 1 or 2 second.. The parameter "ptTrackingDepth" is the threshold value of the frame number in which the object was not found and then tracking will be stopped. The default is 40 frames (about 1.5 seconds). It is useful to reduce this value if you try to make robot control in real-time. For example if an object disappear in the frame and there has no object last one and a half seconds but robot continues to level up at him and accordingly controlling is not correct. I use SetParam(ptTrackingDepth, 2) in my experiments of the robot control. navigator plugin in that library...can i use it with c#..and is there examples to show how to use it?? The �avm061.dll� file is the implementation of AVM algorithm (it is provided an object recognition only). You can use for autonomous robot�s navigation �AVM Navigator plugin� that connect to your C# application with helping of RoboRealm API ( http://www.roborealm.com/downloads/API.zip ) or develop your own navigation program.